Benjamin Historic Certifications helps owners of historic homes receive a freeze on their property tax assessments. In 1983, the State of Illinois passed a statute enabling homeowners who rehabilitate their landmark property to receive a freeze on their property tax assessment for eleven years. This is called a "certified rehabilitation." What is a Landmark property and therefore eligible for the Property Tax Assessment Freeze? 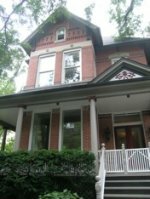 There are many designated landmark houses and Historic Districts with buildings that are eligible to receive the Property Tax Assessment Freeze. These landmark buildings and historic districts are located in Chicago and the city's suburbs as well as throughout Illinois. Individual buildings and areas may be nominated for landmark designation by Benjamin Historic Certifications so that a property may qualify for the assessment freeze. How does the Property Tax Assessment Freeze work? It freezes a property's Assessed Valuation for 8 years at the level it was at when the rehabilitation work began. At the end of 8 years, the assessed value increases gradually, over a 4-year period. The freeze offers an 11-year tax benefit. Who may be eligible for the freeze? Developers or individuals acting as developers may rehabilitate a landmark house and sell it with the purchaser receiving the property tax assessment freeze. A developer can also buy a landmark building (such as a factory, office building), convert it to condominiums and sell each unit with the freeze. What is required to recieve the Freeze? What does Benjamin Historic Certifications do? Prepare all the necessary documentation required for the freeze program. We administer the Assessment Freeze certification process from beginning to end. If the project is complete, we advise homeowners of the likelihood of their rehab qualifying for the program—at no charge. We often discuss the proposed work in the early stages of a project, guiding the homeowner towards making the work qualify. If it qualifies, we assemble drawings, take photographs, process the architectural and financial paperwork and coordinate all work with the reviewing architect and the administrator from the State Historic Preservation Office (SHPO). How does Benjamin Historis Certifications charge? Our fee is modest, based on the Assessor's Fair Market Value of the property. Why hire Benjamin Historis Certifications? We can assure that the process is handled in an easy, efficient manner. We do all the work. We advise on how mistakes can be avoided so that the freeze isn't lost. We are experienced and have a long, well-established working relationship with the SHPO, which administers the tax freeze program. Because of our combined expertise in the history of architecture, we can write the local Landmark or National Register nominations that make properties eligible for the Assessment Freeze. We have worked on hundreds of tax freeze projects for houses, condominiums and cooperatives throughout the Chicago metropolitan area, including the North Shore, and Western Suburbs. In Chicago, we have worked on projects in the Gold Coast, Old Town, Mid North, Lincoln Park, Lakeview, Hyde Park-Kenwood and several other community areas. We are pleased and available to work in and around Chicago.